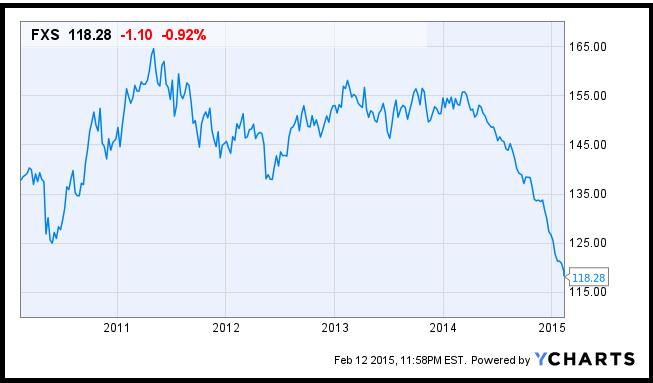 The Riksbank cut its benchmark rate into negative territory in February. The move was an effort to better reflect declining inflation, as well as uncertainty over its economic future. As Swedish policymakers lean towards lower interest rates, the krona should continue to decline against stronger currencies, such as the U.S. dollar. The Swedish krona fell on Thursday as its central bank cut the benchmark interest rate into negative territory to better reflect falling inflation measures and economic weakness abroad. CurrencyShares Swedish Krona Trust (NYSEARCA:FXS) is down over 25% since March 2014, as is seen in the chart below. The Riksbank cuts its benchmark rate into negative territory in order to fight falling inflation, as well as weak economic growth abroad. 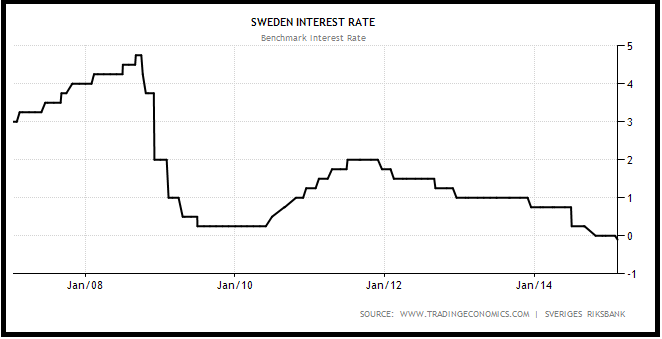 In February, Sweden's benchmark rate was cut to -0.1%, below the previous rate of 0%, as well as missing estimates for 0%. On top of the rate cut, policymakers stated they would buy SEK 10 billion government bonds, while noting they were prepared to do more if conditions warranted. Since 2009, the Swedish short-term rate has been cut from near 5%, to now negative levels, shown below. Policymakers cited uncertainty over future economic conditions as a reason for the bold rate cuts. "There are signs that underlying inflation has bottomed out, but the situation abroad is now more uncertain and this increases the risk that inflation will not rise sufficiently fast. The Executive Board of the Riksbank has therefore decided to cut the repo rate by 0.10 percentage points, to -0.10 per cent, and to adjust the repo-rate path down somewhat. Moreover, the Riksbank will buy government bonds for the sum of SEK 10 billion. 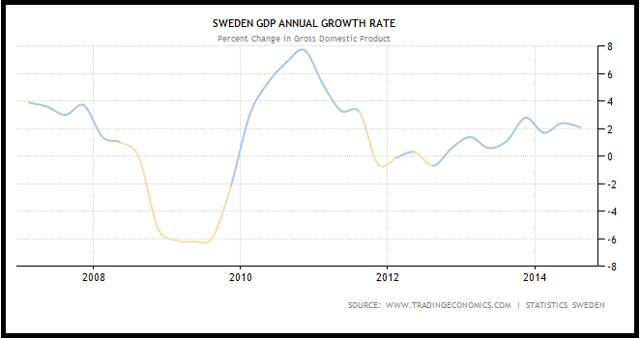 These measures and the readiness to do more at short notice underline that the Riksbank' is safeguarding the role of the inflation target as a nominal anchor for price setting and wage formation," according to Trading Economics. 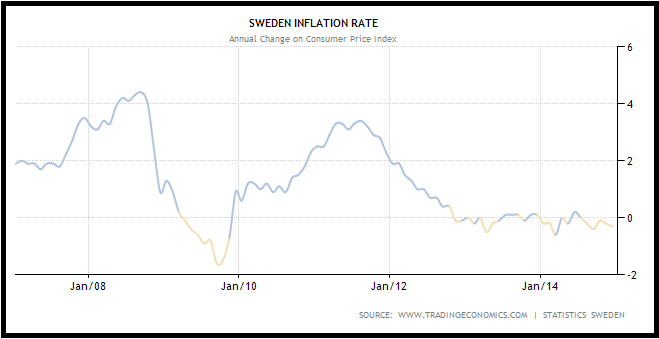 Inflation measures have broadly fallen in Sweden since the financial crisis, causing policymakers to lower rates to better reflect conditions. In December, the inflation figure came in at an annual pace of -0.3%, below the previous month's reading of -0.2%, as well as missing estimates for -0.6%. Since 2012, the annual pace of inflation fell from near 4%, to now below 0%, as is seen in the chart below. While annual price growth had oscillated around 0% since 2013, the recent decline in energy prices pushed the inflation measure into deflation territory. As interest rates have fallen alongside declining inflation measures the last few years, economic growth gradually recovered. In the third quarter, the economic growth figure came in at a 2.1% annual pace, below the previous quarter's reading of a revised 2.4%, while missing estimates for 2.3%. Since bottoming in 2012, annual economic growth readings have gone from contraction, to now a respectable 2% pace, shown below. Policymakers, however, fear that both economic weakness in the euro area could soon drag down Sweden's economy, as well as strong inflows into the currency may hamper exports. Swedish policymakers cut benchmark interest rates to better reflect declining inflation pressures, as well as deter capital inflows that may make its economy less competitive in the face of monetary stimulus in the euro area. While the krona may appreciate against the euro in coming months, it will most likely continue to decline against currencies favoring tighter policy, such as the U.S. dollar.